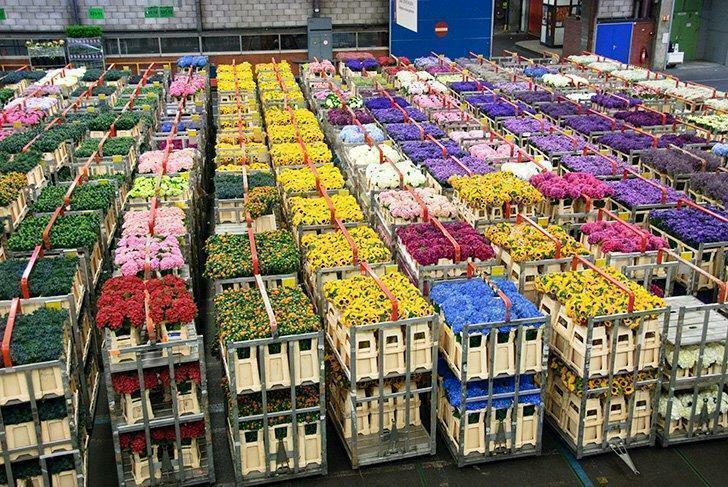 Owned by Royal FloraHolland, the Aalsmeer Flower Auction in The Netherlands is the worlds largest flower distribution centre. It’s an easy day-trip from Amsterdam. We’ll show you how to get there and what to expect. [UPDATED 2018] The Royal FloraHolland Aalsmeer flower auction is one of the most popular day trips from Amsterdam, the Netherlands. We’ve updated this article with new information for this fantastic day out in Holland. By car – The easiest way to get from Amsterdam to Aalsmeer is by car. The journey takes about half an hour on the A4 highway and there is ample free visitor parking once you reach the Aalsmeer flower auction building. By Public Transport – If you’re visiting the Netherlands and aren’t comfortable driving (the traffic can be intense for first-timers) you can take the Connexxion bus 357 from Amsterdam Centraal Station to Aalsmeer. The bus stops right at the front door and the stop is called Hoofdingang. By private tour – The first time we visited the flower auction in Aalsmeer, we had too many family members with us to fit in our car. 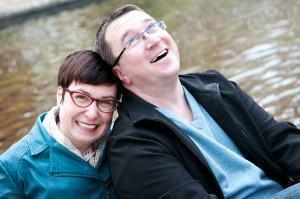 Instead, we opted for a full day tour package which we can highly recommend. Everyone in our multigenerational group loved the tour. In addition to taking us to the Aalsmeer auction, we visited a Delft Pottery Factory and had some time to explore Delft’s historic centre, we saw Madurodam, which has all of the Dutch landmarks in miniature, we toured Rotterdam and The Hauge and stopped at Scheveningen, the beautiful North Sea resort town. It was a jam-packed, wonderful day. 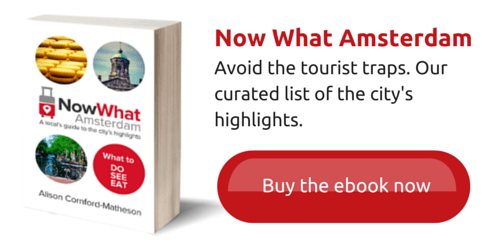 The tour package seems expensive, but when you split it across your entire group and factor in the cost includes all of your admissions, transportation and a private guide, it’s a steal. 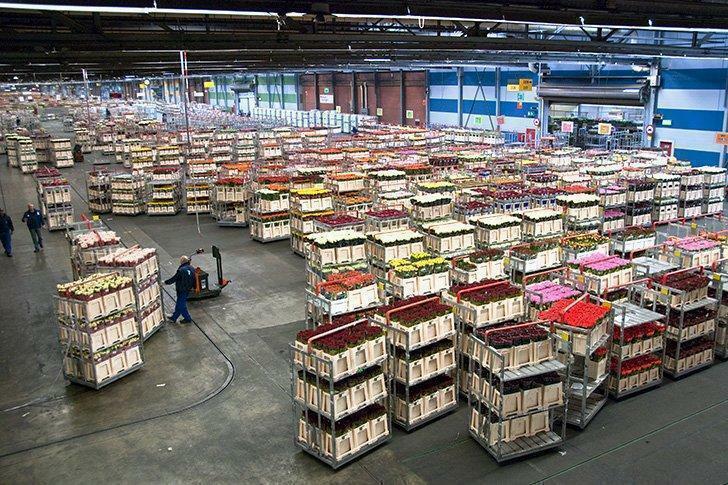 34.5 Million Flowers and Plants pass through the Aalsmeer Auction each day! There’s no doubt springtime in The Netherlands is a Mecca for garden lovers. But if you can’t make it to Holland for tulip season, you can still get your fill of beautiful blooms year-round by visiting the FloraHolland flower auction in Aalsmeer. 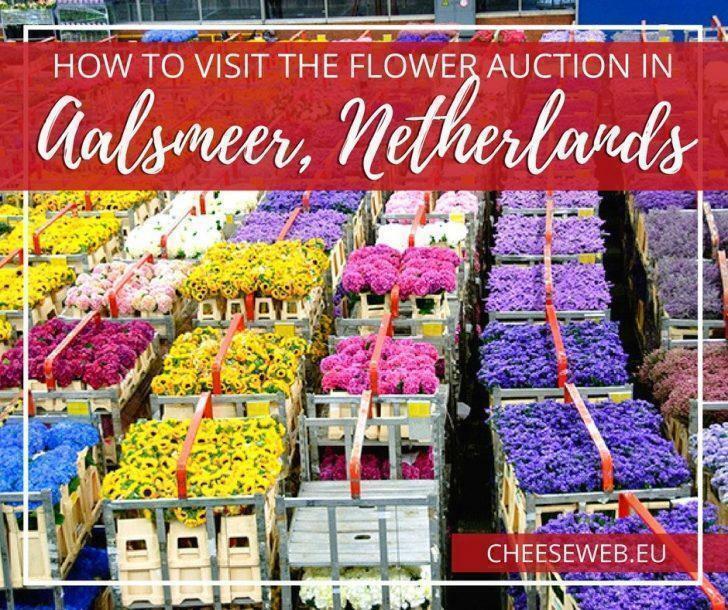 At first thought, a flower auction may not sound very interesting… but let me assure you, the Aalsmeer auction is incredible. First, the sheer size is staggering. The building is the second largest in the world in terms of floor space, covering 990,000 m² (10.6 million sq ft). 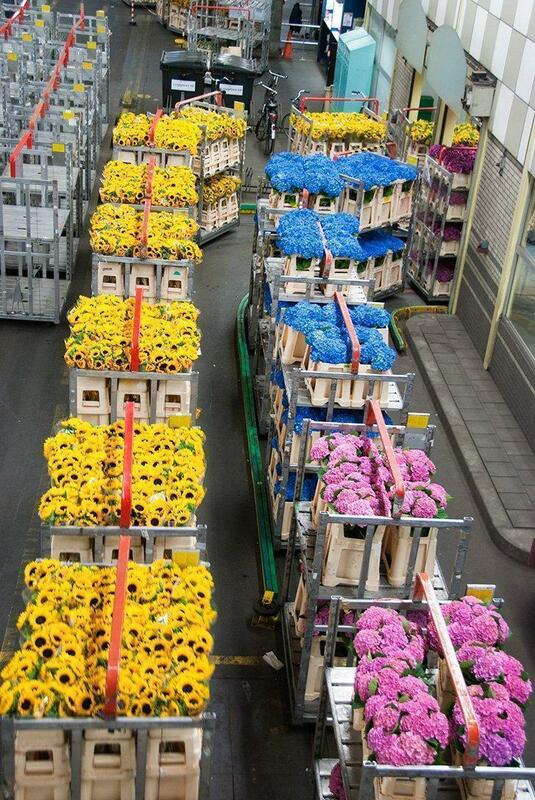 It is located not far from Schipol airport so the flowers can be shipped quickly, all over the world. The auction building needs to be massive because of the 34.5 million plants and flowers that pass through EACH DAY! That’s a turnover of 9.6 million Euros worth of blooms and leaves, daily. 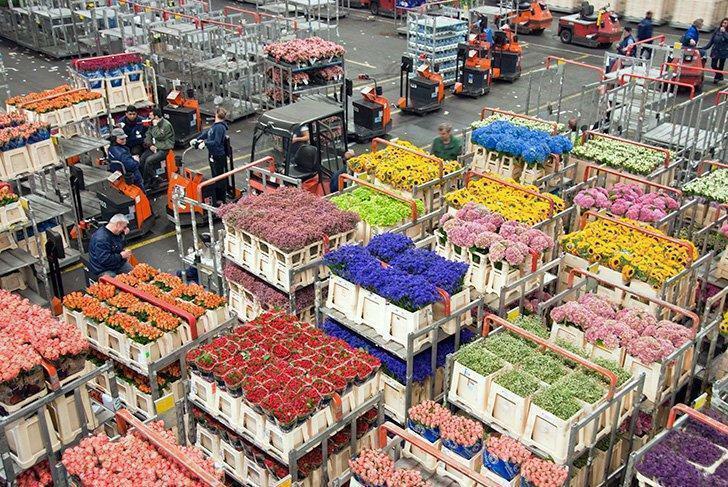 Each year, FloraHolland auctions over 12.5 billion flowers from around the globe. 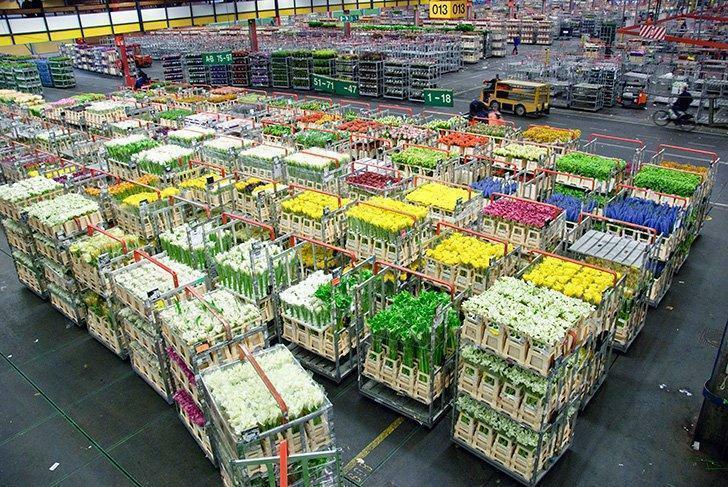 When you visit the Aalsmeer flower auction you’ll be surprised at just how busy it is early in the morning. As a visitor to the Aalsmeer Flower Auction, you walk on a pedway above the warehouse floor and watch the organised chaos and an endless parade of colourful flowers pass by below. 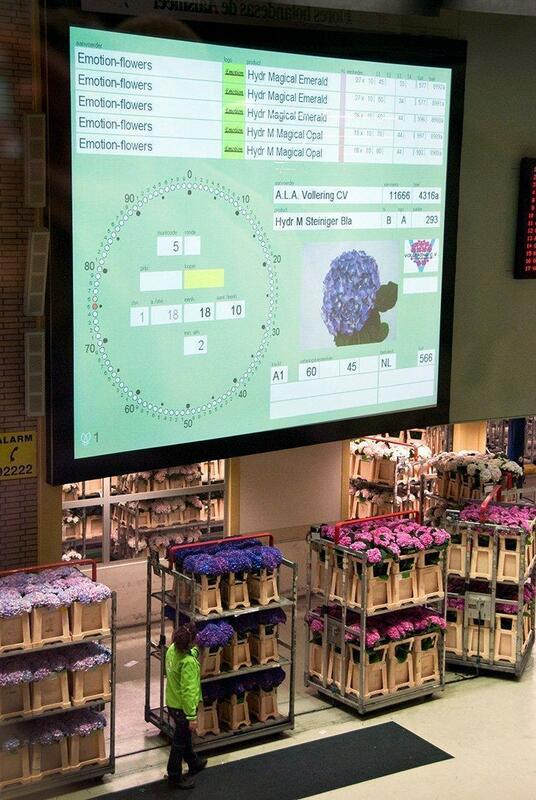 To get a sense of what you are watching, FloraHolland offers a handy leaflet that gives a 24-hour cycle of the plants’ journey through the warehouse. Carts full of flowers enter the auction room at the Aalsmeer Flower Auction. The process begins, the night before the auction, at the nurseries. FloraHolland works with tens of thousands of growers in The Netherlands and around the world. At 5:00 pm the plants are packed and loaded onto trolleys. The growers fill out an electronic delivery form and the plants are on their way to the auction building. At 10:00 pm the plants arrive at the auction and are scanned into the system. The grower takes the empty trolleys back to the nursery to fill for the next day. In addition to elsewhere in the Netherlands, the flowers come from all over the world but the top five import countries are Kenya, Ethiopia, Israel, Belgium and Germany. The flowers and plants are taken immediately to the refrigerated area. They are grouped by the variety and refrigerated at the correct temperature for each type of plant. At 4:00 am quality inspectors do random checks to ensure the quality listed, by the grower on the electronic form, is correct. Once the plants are inspected, they are ready for the auction clock. At 6:00 am the auction begins. There are six auction sites across the Netherlands, including the Aalsmeer site. There are 13 auction rooms and a total of 38 auction clocks at the various auction buildings. Buyers from around the world fill the auction halls. Potential buyer wait for the prices to drop on the auction clock. The auction clocks are projected on huge screens. They show a photo of the flower or plant and all the information the buyer needs to know. It is a reverse auction, so as the clock counts down, the price goes lower. A buyer can stop the clock at any price point and say how many bunches of the plant they want to buy at the current price. The price continues to drop until every bunch is sold. In a single day, there are more than 100,000 transactions. By 11:00 am, the sold plants move to the distribution area where they zoom around on motorised trolleys and are deposited onto carts organised by the buyer. Once the buyer’s order is complete the cart(s) are wrapped and loaded onto trucks for shipping. The flowers are delivered on the same day to locations all over the world. The top five export countries are Germany, Britain, France, Italy and Russia. This cycle continues each and every weekday all year long. 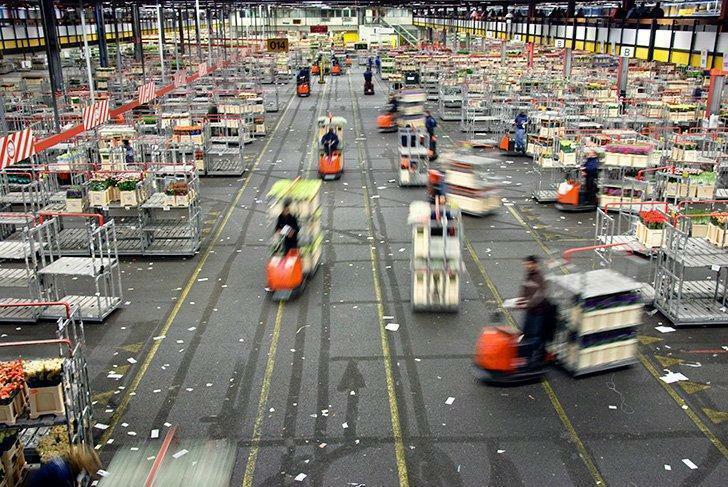 The motorized carts move quickly throughout the warehouse! If you have a passion for plants or are simply interested in how the mechanisation of this huge distribution network functions, the Aalsmeer Flower Auction is definitely worth a visit. It’s an easy early morning day trip from Amsterdam. Check out this short video I made of the Aalsmeer Flower Auction. 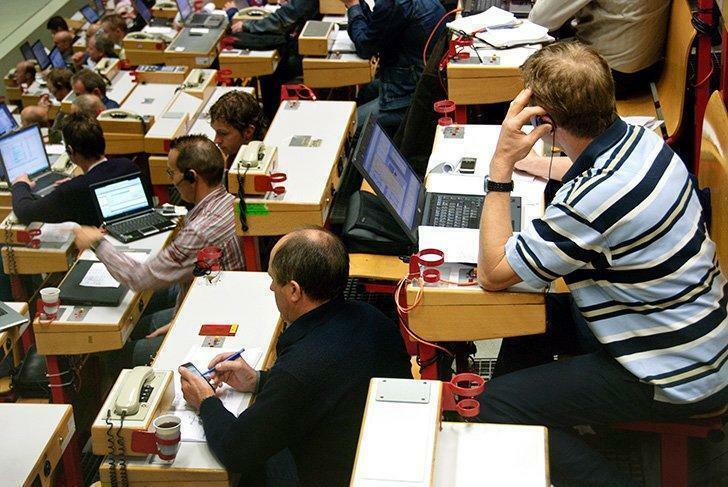 The auction is open to the public on Mondays, Tuesdays, Wednesdays and Fridays, from 07.00 am to 11.00 am, and on Thursdays, from 07.00 am to 09.00 am. You should visit as early as possible in the morning because most of the action starts as soon as the doors open. Have you been to the Aalsmeer Flower Auction? Leave your comments below.